The gorgeous Edwardian Kings Theatre is ideal for traditional panto, and this is essentially what we get in this Cinderella. The richly-coloured storybook designs use old-school drops and flats and the scenes change with satisfying frequency. It’s lavishly costumed, with the Ugly Sisters – petulant Paul Lawrence-Thomas and implausibly tall, predatory Harry Howle – wearing extraordinary leopard skin outfits. Local boy Jack Edwards’ Wicked Stepmother is a bruiser – a hybrid of Ursula the sea witch, Alexis Carrington Colby and that mouthy bloke from the pub. His ad libs are smart, especially when firing X Factor barbs at Jake Quickenden’s Prince Charming, a laid-back heartthrob. 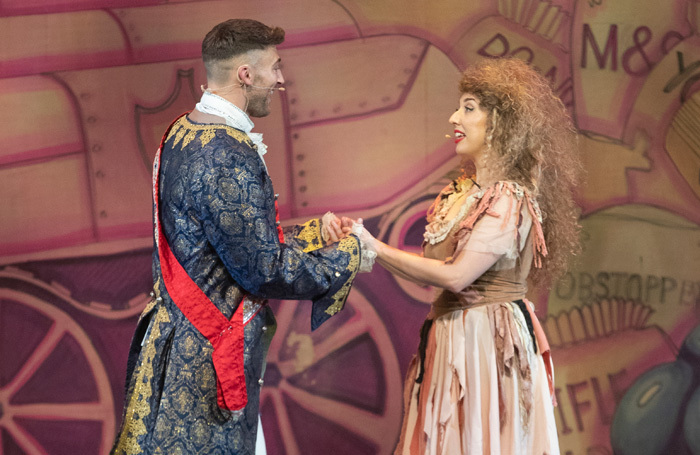 The exuberant Dandini of Marcus Patrick offers the sharpest theatrical timing and Simon Grant, naturally engaging as Buttons, leads the audience participation, while Tom Owen’s Baron Hardup bumbles with the best of ‘em. 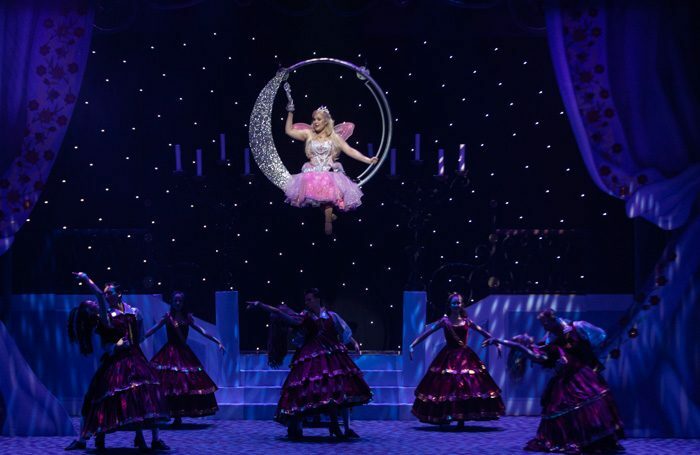 As Cinderella, Kaya Rose goes more for spirit and spark than pathos. Her vocals are strong, but it’s left to Natasha J Barnes – a Fairy Godmother who’s down-to-earth rather than fey – to raise the roof. On occasion, the jokes and big moments (notably the countdown to midnight) go for too little, maybe sacrificed to the smart pacing. The modest amplification also tends to blur the words of the songs, which favour contemporary pop and are mostly kept brief. But there are white Shetland ponies drawing Cinders’ coach, an enthusiastic and well-drilled company of adult and child dancers, and a riotous Twelve Days of Christmas routine which delights the audience as loo rolls are lobbed and kicked as far as the dress circle.